Hot on the heals of news that the fan-favorite Batwing would appear in Christopher Nolan's third Batman film, The Dark Knight Rises, we now have video of the machine in action. But that's not all, the public shoot has also revealed other interesting tidbits - another action-packed Catwoman set-piece as well as Joseph Gordon-Levitt on-set. As we’ve previously warned, on-set shooting details can provide MILD to MEDIUM SPOILERS for The Dark Knight Rises. If you are attempting to avoid spoilers altogether, please be advised to turn away now – you have been WARNED. 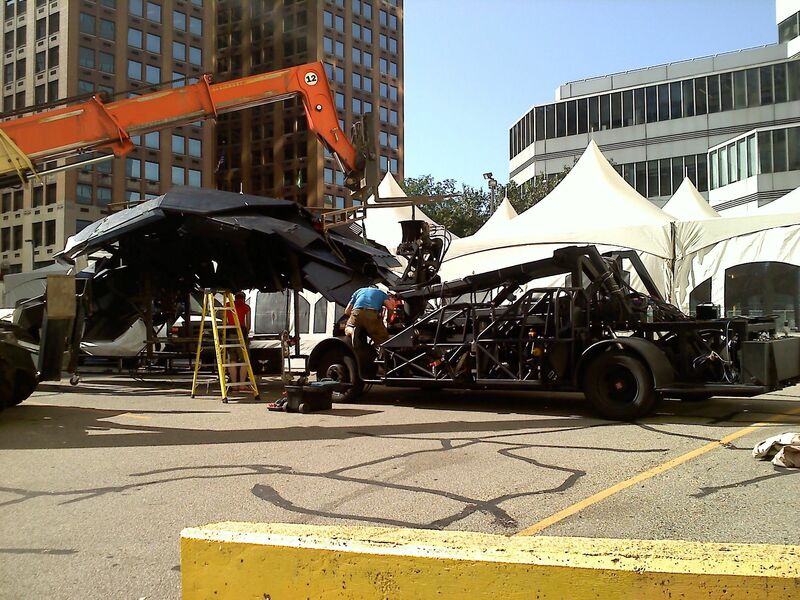 First-up we've got new images and video of the infamous flying machine that surfaced on a highway yesterday during The Dark Knight Rises shoot. While the images certainly hinted at the possibility the vehicle was Nolan's take on the classic Bat-plane, the Batwing, the new video abolishes any lingering uncertainty. Astute moviegoers will no doubt notice a strong similarity to the military vehicles in James Cameron's Avatar - especially when the Batwing is viewed from the side. Certainly the appearance of the Batwing is the most exciting Batman news of the last couple days but, considering the number of comments on our prior Catwoman posts, a lot of moviegoers are no doubt anxious for another look at the character. While the following images will no doubt fail to put the lingering Catwoman mask debate to rest, the pictures - which once again feature the anti-heroine on the Bat-Pod - definitely corroborate another fan-fueled piece of speculation: that Batman and Catwoman become involved in a high-speed game of Cat and Bat. Last up, following renewed speculation that Inception star Joseph Gordon-Levitt will actually be playing The Riddler, we've got footage of the actor on-set (sans a gaudy green super-villain costume). Batman fans are certainly getting an unprecedented behind the scenes look at one of the most highly-anticipated films of next summer. That said, despite all the reveals, there's a surprising amount of information that's still up in the air - with the public production actually serving-up more questions than answers. Is Gordon-Levitt The Riddler? What does Catwoman's full costume look like? What kind of bomb does Bane use in the Heinz Stadium scene? Time will tell but we'll be sure to keep you posted as more Dark Knight Rises details are announced... or leak out. Follow me on Twitter @ benkendrick.